“Yikes! That looks painful,” I thought, when QT, our oldest resident buck, came for his regular morning visit one day earlier this month. Columbian black-tailed bucks shed their antlers every winter, so I’m used to seeing “our boys” sans headgear for a few months each year. But I’d never seen such freshly exposed pedicles before. Thankfully, within a couple of days the mounting points lost their redness and seemed to harden up, looking like painless brown scabs rather than open wounds. Now, three weeks later, you can hardly notice them at all. Once spring arrives, I’ll be watching with interest as QT starts the whole antler-growing process all over again. 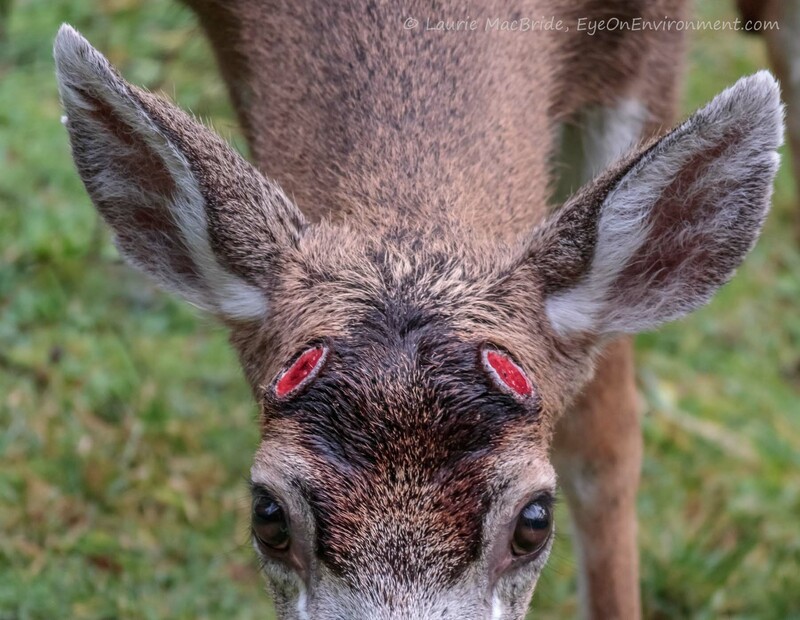 Posted by Laurie MacBride, Eye on Environment on January 24, 2019 in Animals & Wildlife, Mammals and tagged animal behavior, antlers, deer, nature, wildlife, winter. Thanks, Patti – glad you found it interesting & hope all’s well with you. Thanks for the comment, glad you found it interesting. As for your question…I don’t think so. From what I’ve been able to learn, there are specialized bone cells that develop as the buck’s testosterone levels drop (which happens each winter), and these cells weaken the attachment until the antler just drops off. They’re akin to specialized bone cells that we humans have, which enable bone tissue to break down and reform after we break a bone. Apparently the loss does not hurt the buck. But it does look like his head could feed rather tender and vulnerable at first! Thanks Susan, will have a look.